Drawing parallels between the past and the presence, some of the e-Commerce adepts remind me of ancient alchemists. Just like the last ones attempted to transmute common metals into gold, merchants are searching to discover an all-powerful money milking shopping cart. Both camps are in the captivity of illusions. But, as always, the truth lies somewhere in the middle. 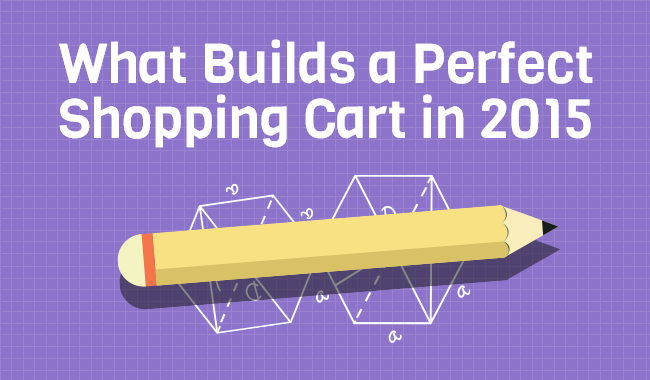 So, what builds a perfect shopping cart? Or rather, to say “an almost perfect” shopping cart. That’s the question already answered in our free e-book “What Builds a Perfect Shopping Cart in 2015 - 69 Stats to Know” you can download for free. But for now, we’ll review the main extracts you need to know about building a powerful e-Commerce solution. The era of mobile devices has started. Since 4 of 5 smartphone users utilize their smartphones to shop online, responsive design has become essential rather than preferable. Shopping carts with responsive templates ensure an adequate content display on various devices, as well as a solid and convenient cross-channel shopping journey. Responsive template, of course, will necessarily pay off in conversion rate increase. Otherwise, the absence of responsive design leads to nearly as high as 40% of website abandon rate by mobile visitors. Checkout is one of the top elements of a good shopping experience, a point where a customer decides whether to purchase a product or not. And since an average checkout abandonment rate states for no less than 67%, there’s sure something needs to be done about it. One step checkout and a guest purchase option are among effective ways of reducing such a drastic abandon rate and making your online retailer a bit more perfect. 🙂 Checkout in one page does not only ease the customers’ mind by looking less complicated and weighty, but also save them a considerable amount of time too. The same concerns guest purchase - a simple “Buy as a Guest” option may eliminate nearly 30% of abandon rate. A worthy reward for saving 3 minutes of your customers’ time, don’t you think so? According to the numerous marketing researches, 93% of all buying decisions start with an online search. Thus, the absolute best way to sell more is to invest in a good SEO strategy for your store. But how far can you get when the e-Commerce solution you use is just not capable of getting ranked high in search results? A perfect platform (of even quite moderate) needs to be optimized for search engines - automatically create SEO-friendly links, add unique keywords and product descriptions, etc. Just think about it: first page websites get as much as 90% of Google traffic! Being directly proportional, CTR decreases dramatically with every position on Google lost - #3 on search results gets 4 times less traffic than #1 - just 11%. And don’t think you’ll compensate the flaws of your platform’s SEO by investing heavily in AdWords - 7 of 10 users ignore paid ads, focusing on the organic results only. If a consumer has been using a particular payment gateway for years, it becomes a matter of habit and trust. But what if you don’t offer that preferable gateway in particular? People may get suspicious, or just annoyed they cannot perform a payment however they want. In any case, 59% will abandon a transaction if a preferred payment method is not in place. Thus, a support of multiple payment gateways, out-of-the-box ideally, is essential for building a perfect shopping cart. Quite often a solid marketing strategy handles more than a half of e-Commerce sales in total. But can every shopping cart boast about a worthy range of marketing tools? Let’s enumerate the most basic yet important marketing features a perfect shopping cart needs to possess. 1. Coupon Generator & Discount System. Being actively used by a 50% of the U.S. customers, coupons and discounts are important promotional elements of every shopping cart. They are great incentives when you need to boost your sales fastly and easily. According to the studies, about 60% of whom used a coupon code said they would not buy the item(s), if they had not received a discount. 2. Email Promotional Tools. Despite the plethora of new marketing channels available, email is still one of the most important methods merchants use to engage with consumers and drive sales. It’s stated that 44% of email recipients made at least one purchase last year based on a promotional email. And don’t forget - email promotion is 100% free! 3. Product Reviews. 63% of customers are more likely to make a purchase from a site that has user reviews. They serve two purposes: to eliminate any doubts potential customers may have about an item and help product selection. They also leverage social proof for your business, which will probably convince people to buy from you instead of competitors. The success of international sales mostly depends on how good your shopping cart is adjusted to each targeted country in particular. Since 55% of customers buy only from websites where information is presented in their native language, your chances of succeeding globally without localization are pretty slim. Adaptation to global market doesn’t stop on the support of multiple languages though. 28% of consumers say the ability to buy products in their own currency is more important than price. Moreover, a mere implementation of local currencies support may increase international sales up to 15%! So, is that what builds an ALMOST perfect shopping cart? Most probably yes. However, if an e-Commerce solution you use is far away from being ideal… perhaps it’s time to bring some changes and move your business elsewhere, right? Cart2Cart automated shopping cart migration service is here to help! Start with free Demo Migration and check out how automated migration works within 30 minutes!